Directors, Michael and Jeab Glass. I was introduced to building with children by a great mentor, Al Mayberry, in 1982. For me it was an opportunity to integrate my interest in working with kids with my experience in construction. After graduating from U.C. Berkeley, in 1979, and deciding not to enter the field of environmental law, I began to learn a trade. I worked with some very talented builders on new construction, cabinet making, log cabin construction and remodeling. 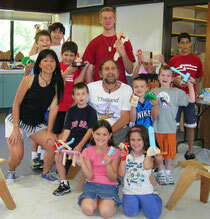 But it wasn't until I began teaching woodworking to children that I realized my calling. It is truly a blessing to be with kids and be able to impart some life-long skills and see how they become passionate and independent thinkers! Since 1999, I have had the pleasure of co-teaching with my super talented wife, Jeab! READY TO MEET OUR OTHER GREAT TEACHERS? 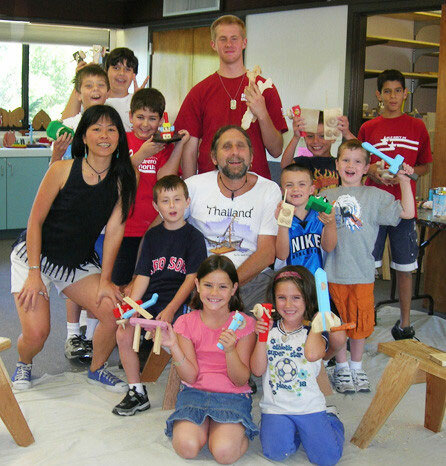 Click on a name at the right (or below) for a Kids' Carpentry teacher near you. Read more about that teacher's interests, their programs, and their contact/registration information.